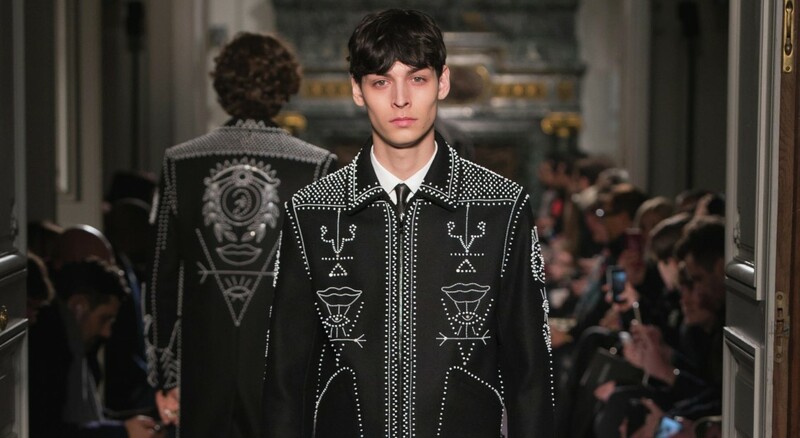 For their collections at Valentino, creative directors Maria Grazia Chiuri and Pierpaolo Piccioli take inspiration from an ever-shifting array of cultures, subcultures, social cues and clans. Their language is global and they’re constantly feeding it new turns of phrase. 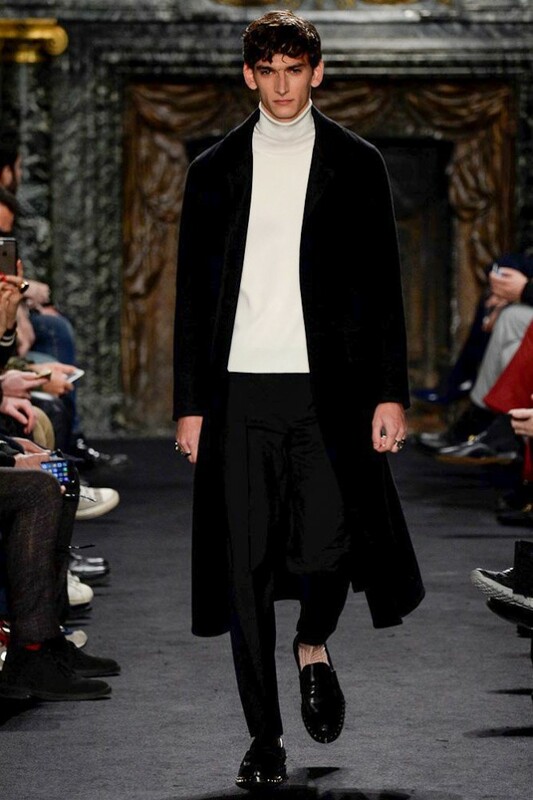 FW16 was a celebration of this melange of inspirations, painting the wardrobe of a man whose life sees him on a constant journey of (self) discovery. First let’s talk about the outerwear. At Valentino it’s a sure thing: the Rome-based house has its foundations set in impeccable craftsmanship, when you buy a Valentino coat you buy a piece of couture. This season they were dark, sharply cut, double cashmere (and double breasted), often modish. Dove grey pieces had their shoulders drawn attention via tiny embellishments. From Look 10 the monochrome palette was broken up – first with a classic camel trench, then with a tasty, shiny wine-coloured coat. Now to those fine white dots, lines and symbols that were cast across looks 16 through 19, a nod to what the show notes described as ‘tribal embellishments’ and Pacific Northwest traces. Where this time last year the focus was on abstract art movements like cubism and futurism, this time the designers looked to a different kind of cultural visual motif. This influence became more apparent as we progressed from the formal and evening- heavy first segment of looks, but soon we got an explosion of super worn out, blue washed denim (customised with studs) And worn with Texan style shirts and paired with geometric printed jackets, shirts, technicolour Navajo blankets, tassel jewellery and neck scarves, it adeptly falls into place. Killer cropped denim jackets morphed into check shearling lined ones, but it was the ending that really resonated on a very Valentino level. Two full check looks, both tailored, one green one red. The converging of impeccable workmanship, of elegance, and of something that felt self-confident – and inescapably punk.